The drive mode for my Nissan Juke is controlled by a three-way switch on the right side of this panel. The selections are 2WD, 4WD-V (for vectoring), and AWD. The forecast was slightly different than the weather: the ice storm we dreaded was mostly snow. Anyone who drives in inclement weather knows how much easier it is to drive on snow than on ice. We ended up with about four inches of snow on top of some light sleet. Despite the weather, we still need to put out the newspaper, so I am working today. It’s not really a problem, though, because my Nissan Juke has all-wheel drive. There are five tiers of drive trains in cars and light trucks. Conventional two-wheel drive. Prior to advances in auto design, most cars used this system. Most light trucks still use it. A drive shaft feeds engine torque to a differential at the center of the rear axle, which then feeds torque to the rear wheels. This is not a great choice in mud or snow because the wheel with the least traction will spin. The first cars I drove, my dad’s, had this. Conventional two-wheel drive with a limited slip or locking rear differential. This is a step up, because if one of the rear wheels slips, a flywheel in the differential reroutes power to the other rear wheel. Front-wheel drive. Instead of the transmission sending power down a drive shaft, these use a transverse (sideways) mounted transaxle that divides power between the front wheels. Newer front-wheel drive systems use some form of “traction control” to prevent one wheel from spinning. My first three cars did not have traction control, but my Chevy Cavalier and Pontiac Grand Am did, and it made a difference. All-wheel drive. My Nissan Juke has this. 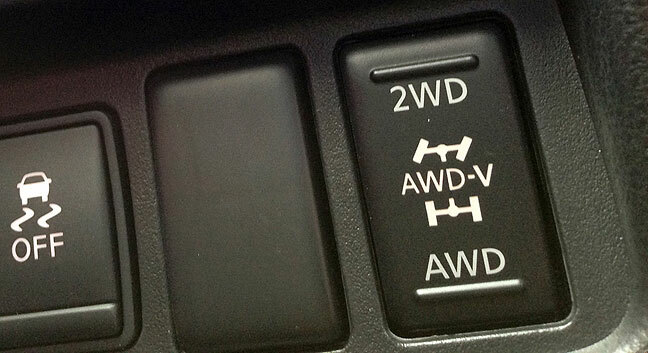 In the AWD setting, power is sent equally to all four wheels, governed by a traction control computer. The Juke adds a setting labeled “AWD-V” which provides variable power to all four wheels to improve driving performance in normal conditions. Four-wheel drive. When set to 4WD, power is sent to all four wheels. In snow, ice or mud, it performs very much like all-wheel drive. The main difference is that true four-wheel drive usually has a “low” setting that allows the vehicle to crawl over rocks, rises and depressions that all-wheel doesn’t. Abby’s Nissan Frontier pickup has four-wheel drive. Since I had to be out and about today to photograph the storm, on a few occasions I pushed the Juke’s AWD a little, and I was genuinely impressed by the system. In spite of conditions being slick, I found the car reluctant to slide or skid, even with aggressive use of throttle and clumsy steering. It seemed eager to go in situations where nearby vehicles seemed to spin their wheels and fishtail. Also, the anti-lock brakes seemed very responsive, even when I applied full-pedal to test them. Abby’s truck boasts similar abilities. All-wheel and four-wheel drive capability are luxuries we are both glad we possess. 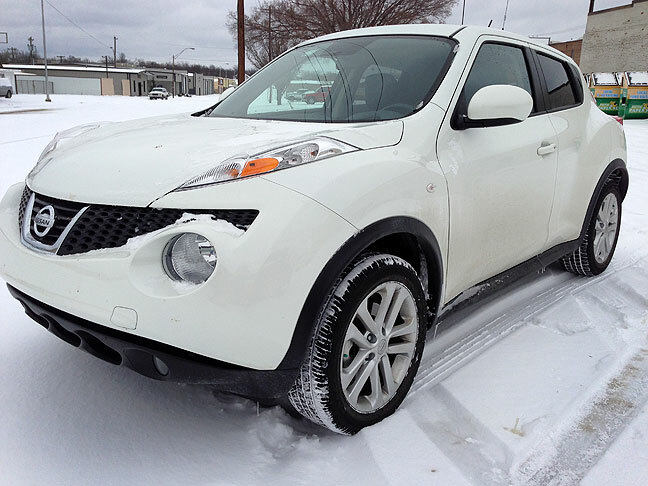 My Nissan Juke sits in the snowy parking lot at my office in downtown Ada this morning. Glad you made it to work without issue. Having grown up with drive system #1 (from your list), we were always fortunate to have our ’69 Beetle around; it had two-wheel drive, but the engine’s weight sat on those axles, which helped a bunch on ice. Our station wagons were useless in mud, snow, or ice. All our current vehicles are #3 — front wheel drive. They seem to do okay, as long as the driver is careful and thinking ahead (and keeping an eye out for Stupid People). I like the way you capitalize “Stupid People,” like it’s a royal title. It’s more of an award that has to be earned, like a Pulitzer or Rhodes Scholarship, except kind of the opposite. It doesn’t mean they’re stupid, anymore than a Pulitzer means you’re smart — it’s based on actions and the alleged thoughts behind the actions. * Noticed it’s below freezing outside and raining. * Decided to drive faster than normal and make sudden driving maneuvers such as sharp turns or hard braking. The only vehicle that I ever got stuck in the snow was ’98 Frontier. I was getting on the highway and simply slid from the on-ramp all the way to the railing of the left lanes. It was rear-wheel drive and I had no weight in the back. Richard and I managed to get my AWD Element stuck in mud. It was an area on the side of the road in Utah that was filled with mud that was super slimy. The AWD on an Element is “a hydraulically actuated system that operates only when front wheel slippage occurs, marketed as “Real Time” all wheel drive.” Meaning that you had to be moving for it to kick in. It was a non-problem as the area was so flat and mud so slippery that we simply pushed the Element sideways out onto the road. My Civic Hybrid has an extra 250 lbs of battery right over the rear axle. With a full tank of gas, it’s probably one of the most balanced cars I’ve ever driven. I finally figured out what was bothering me about the types of drive. I realize that it says ‘some’ drive-train, but you’ve omitted your first car. VW Beetle’s were rear-engine rear-wheel drive. I don’t remember how it handled in snow and ice. Care to comment? The layout of the VW drivetrain is like a backwards front-wheel drive. In practice, it’s not much better than conventional rear-wheel drive, despite the engine weight in the back; you can get going a little more often when it’s slick, but having neither weight nor drive power on the front wheels is a liability. It tends to want to keep going straight in the snow even when you are trying to turn. My experience is completely different. Sure, you don’t have weight on your steering wheels, but your drive wheels are getting traction. I putt-putted up some steep icy hills while other vehicles (of various drive types) were spinning and sliding past me. The Subaru Justy, my favorite car. I’ve owned three. I (unwisely) floated alone across 3 hours of a ice laden two foot snowfield that was previously a interstate, between Boston and Laconia NH during the height of a midnight storm. By the way, don’t do this. Wil, as I said, the VW’s engine-over-drive-wheels arrangement would get you going in snow or ice. I agree that it was better than front engine/rear drive. I just didn’t like the way the front end was so light that it tended to keep going straight when I asked it to turn. That’s where front-wheel drive is a champ – vectored thrust. It pulled in the direction you wanted to go.